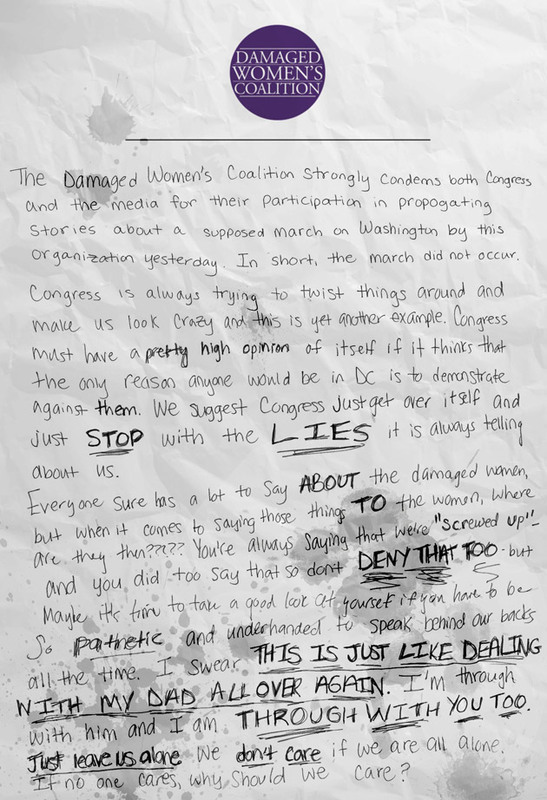 Here’s a close up of the Damaged Women’s Coalition tear-stained letter of blame, denial and demands. How many of you have received something like this after a rage out/blame/attack/gaslighting episode? Dr Tara J. Palmatier provides confidential, fee-for-service, consultation/coaching services to help both men and women work through their relationship issues via telephone and/or Skype chat. Her practice combines practical advice, support, reality testing and goal-oriented outcomes. Please visit the Shrink4Men Services page for professional inquiries. Right down to the running mascara. The Onion is a satirical publication/website. In a sense it is real because we all know folks like this. However, no, drunken unstable women didn’t really march on Washington. . . yet. Thanks for the clarification and it did seem very real and plausible in this day and age….it reminded me of something out of a zombie movie. Has someone rushed this over to the Jon Stewart show!!! Ripping up posters in public? Drunk and disorderly at 2 AM? Yes, cluster B abusers often do there best work at night. I know. Even in a piece of satire, they all read from the same script. It kind of dispels the “I’m a special snowflake” mindset when you can parody this behavior because it’s so similar it’s a stereotype. I could barely watch it. They were all projecting their inner two year old. And folks – you REALLY have to put ‘borderline personality disorder’ on the search section of that site on the left. I’ve never laughed so hard at what it led me to. Only mistake – they should have placed the pic of a woman on that post as well. Now what exactly does ‘APD’ stand for again 😉 ? I was subjected to a vicious online smear campaign last year for writing pretty much the same thing. Hadn’t heard of uncyclopedia before. Good stuff. yes – that summer one was vicious, and much like Lynn’s videos brought back PTSD memories to many of us (in my case, my narc sis dearest’s rants, and for the men here, their exes.) Another characteristic of APD-bearers (both in the ‘proper’ definition and the uncyclopedia definition) is that they almost completely lack a sense of humour and/or the ability to laugh at themselves. Next time anyone thinks your no-nonsense TRUTHful writing is blunt – they should read how accurately the satirists have nailed it..and maybe audition for the Onion’s DWC. Dear Dr Tara…You have a large group of supporters now that will not stand for any smear campaign against you.You never have to stand alone again.Thank you for hanging in there. WOW! I am nearly shaking…. well I am with laughter. Particularly when the woman berated and cussed and then said… “Don’t you walk away from me” … remind’s of all the times I turned my back and walked away and hung up on the phone. CLAIMED being the key word. I had a guy tell me that his BPD claimed she had a miscarriage….mine did the same thing. Number one thing to remember about these personality disordered women is that they don’t tell the truth. If they say something there is no way of telling if it actually happened, or if it happened the way they say it did. And, do they ever get the story the same twice? “I don’t need a therapist to tell me I’m unhappy!” Classic! I wonder how they determine who the Leader is. Most wounded? Hi Marshall(11)Stack….You are so right on…and after the tirade she will “order” you to go buy her a pack of cigarettes…..blame you for not having any liquor and send you running to pick up “anything”….scream and yell at you to hurry up…..How come I don`t have any fresh pajama`s?…stop flirting with every girl you see….don`t talk to the neighbours…..
Too funny. Too too funny. It’s interesting that they had to make the characters “drunk” to make this plausible…when many of us have dealt with these types sober. Also, I had to chuckle at the note they wrote. Typical drop-and-run (passive-aggressive) style of a BPD. Oh, so this was just a parody. Very realistic though. This one is real…SlutWalk Toronto…google it. Great satire, and quite funny. However, it was also an unpleasant walk down memory lane. I resurrected this from a forum entry. These clips are from the show “Almost Live.” It aired in Seattle in the late 80s and early 90s. I can only assume someone on that show was involved with a Cluster B. I hope the hyperlinks work. If not, you can search Youtube by the titles. Theses aired over the span of months or years and don’t miss many tricks. I corrected a couple of hyperlinks. If you want to see how a relationship with a Cluster B is being played out in the comics, check out Candorville. Bell titles his story lines. If you searc on Sasha, you’ll get 3-4 strings. Search on Roxanne and you’ll be able to follow the custody battle he appears to be in. Worst Girlfriend in the world…..joins the band….is totally amazing!! This is even more truthful than reality!!!! I am going to check them all out and forward this to a few musician friends. Thank you Dr Tara for this web site. oh boy that was awesome!!!! and true to the mark. Just watched this no less than 10 times. Perfect. The onion rules, and it’s so nice to laugh at this behaviour after dealing with the sad reality of this nonsense for 12 years.